Research undertaken by ForwardKeys, which analyses over 17 million flight booking transactions a day, reveals anaemic travel growth in the Middle East during the first ten months of the year. International arrivals grew just 1% in the period January 18th– October 18th, compared with the equivalent period last year. The news emerged from the annual Middle East & Africa Duty Free Association (MEADFA) conference taking place in Beirut. The decidedly uninspiring growth was caused mostly by a slowdown in travel to Saudi Arabia and the ongoing blockade of Qatari airspace by its neighbours. Arrivals from the Americas, Asia Pacific and Europe grew by 5.6%, 3.0% and 2.6% respectively but they fell 2.5% from Africa and the Middle East. Within the Middle East, the UAE is the most important destination by far, attracting nearly half of all air traffic. It was up 2% but the next two most important destinations, Saudi Arabia and Qatar were down 2% and 7% respectively. Looking at the blockade of Qatar in more detail reveals that the country has suffered particularly badly from a 34.8% drop in arrivals from other Middle Eastern countries, but it has made up for this to some extent with an 8% growth in arrivals from the rest of the world. Looking in to the future, bookings for the Middle East in the next two months (18thNov – 10thJan) are 2.4% behind where they were at the same point last year. The cause of this slowdown is bookings from Asia Pacific, which are 11.1% behind where they were at the equivalent point last year. By contrast, forward bookings from the Americas, Europe and Africa & the Middle East are all ahead, by 3.1%, 1.0% and 4.3% respectively. 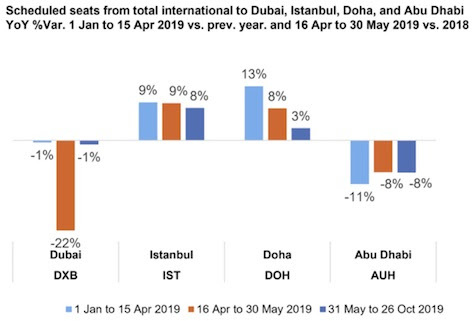 The Asia Pacific setback is due particularly to Pakistan, from where bookings are 35.4% behind. Bookings from Australia are 19.1% behind and from Indonesia, 11.8% behind. From mid-April to the end of May next year, Dubai will close one of its runways for upgrade work. This has prompted airlines to cut their seat capacity by 22% during the period. By contrast airlines are planning to increase capacity to Doha and Istanbul but decrease it to Abu Dhabi.